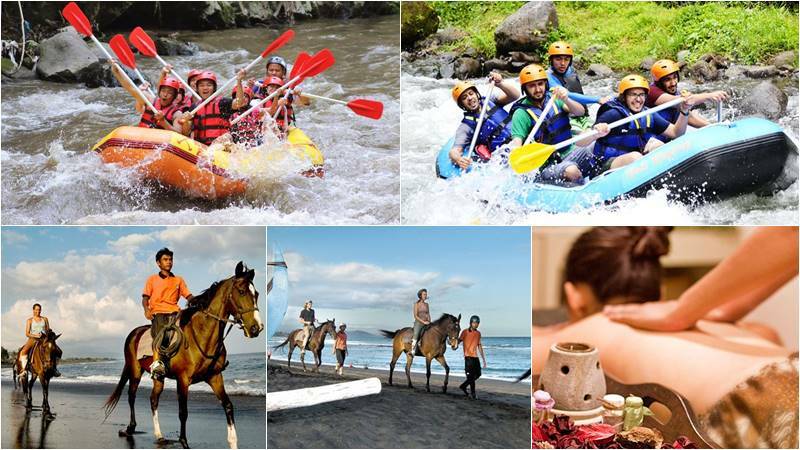 Bali Rafting + horse riding + 2 Hours Spa is famous Bali Rafting tour package, where you will join on Bali river rafting either at Ayung river, Telaga Waja river or Melangit river with the horse riding at Saba Bay through the crashing waves of Saba Beach and will end by 2 hours spa package. If you need whitewater rafting in Bali with the combination tour, we are the right solution for your Bali rafting adventure. 14.00 – 1,5 hours Horse ride. 16.30 – Enjoy 2 Hours Spa treatment. Enjoy 2 hours of white water rafting on the Ayung River along the Paradise River with gorgeous jungle, bamboo trees, cliff carving and waterfall. Or try the most challenging white water rafting with crystal water at the Telaga Waja River, beautiful scenery and jump 4 meters high from the water slide of Bajing Dam.. Last option for your rafting is Melangit river, which has over thirty rapids with 1 to 4 meters in height. The river turning are sharp, currents are fast and impacts of river walls are challenging that make the adventure more exciting. Welcome to Saba Bay Stables. After a brief and complete safety briefing from our professional guides, you’ll be joining the memorable experience of horse riding along the crashing black volcanic sands of Saba Beach. Pass through the Temple of Pura Segara Wilis and take a peculiar look at this seaside village, before heading out onto the wide beach. Nusa Penida Island is a distance away, and you’ll also see the silhouette of Mount Gunung Agung on a clear day. Take a peaceful beach tour before passing the bamboo and alang-alang plantations, where wild banana trees and pineapples thrive. There are also numerous species of birds and a special temple dedicated to the annual rice harvest. Relax and enjoy the Balinese massage, foot bath, lulur or scrub, and flower bath with professional wellness therapist with our 2-hour spa package. Ticket for horse riding with 1,5 hours rides.